The Night Sky is HOT. 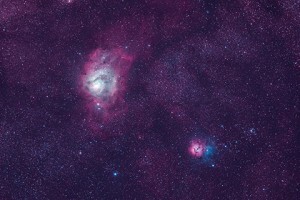 New Zealanders take for granted that we can often see the stars and milky way, not so in most of the world. And apparently people around the world are adding a visit to Lake Tekapo to see the night sky to their bucket list. This small town in south Canterbury has less than 500 permanent residents, but its is already filled to the brim with visitors, and it looks like more are on their way. 10 years ago Mt John Observatory was a locked gate for all but researchers. 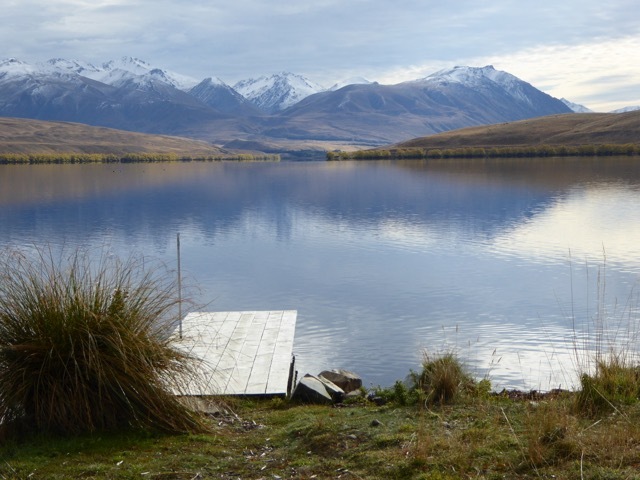 Then along a local enterprise Earth and Sky which has been set up to develop the concept of astro tourism who lobbied internationally for the creation of Dark Sky Reserves – and this area is now the Aoraki MacKenzie International Dark Sky Reserve. 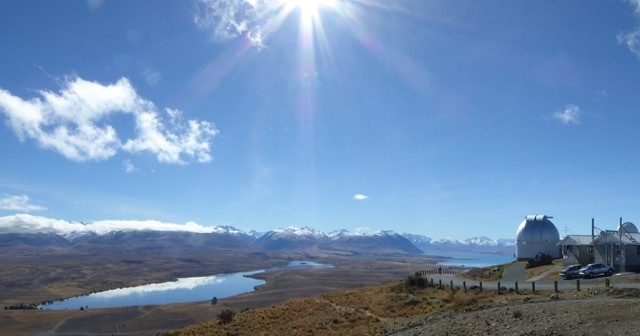 Working with the University of Canterbury, Earth and Sky have created public access to the summit of Mt John which is worth a visit just for the fabulous 360 Degree views. To top it off they have built The Astro Cafe which sits perfectly and unobtrusively at the top of this mountain. Lonely Planet have called it “Possibly the best place on the the globe for a café” and I have to agree – it is stunning. Add to that a world class astronomy research centre with several working telescopes, and you have something very special indeed. The night we were there, the predicted cloud cover had gone and the milky way stretches from one horizon to the other. We joined one of the Mt John Night tours and see Jupiter and several nebula through the telescopes. I marvel at the stories of nebula and new stars and planets being created from star dust in some distant corner of the universe. This is something very special. You HAVE to stay the night to see the sky. pay a bit extra for a room looking over the lake. We are staying at the Godley Resort Hotel, which looks resort like at the entrance, but has in fact older motel style units behind. We are in a ground floor unit with uninterrupted views of the lake, mountains and the Church of the Good Shepherd. The units are a bit tired, but all is forgiven for the view – definitely worth the extra cost we paid. Walking distance to the restaurants and cafes – the Thai Restaurant was great, and morning coffee we brought back to our rooms and sat looking out at our very own private mountainscape and reading the weekend papers. 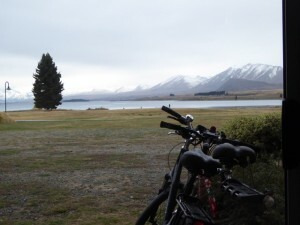 We took our bicycles, an easy cycle to the left and we are at the new Hot Springs. All of this perfectly walkable, I just like biking. To the right down to the Church, and further round the lake. There is a 3km bike ride up the hill, but we give up after about a kilometre as it is through a denuded pine plantation and not that inspiring, and steep in parts. Somehow developers have been kept away from the lakeshore of Lake Tekapo. So there is wonderful walking and cycling behind the town centre. 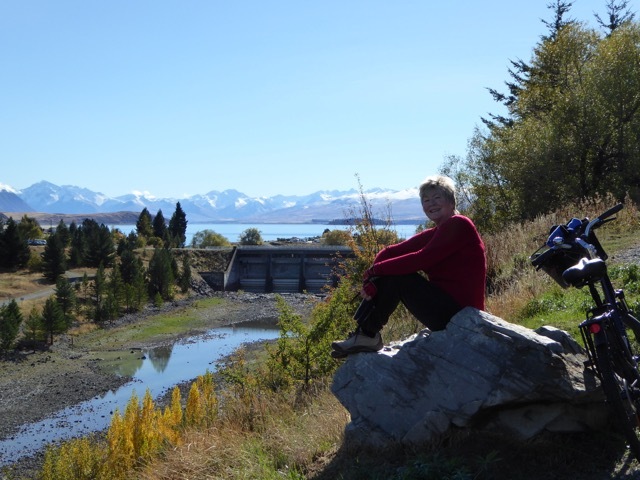 A pedestrian bridge linking the town to the Church of the Good Shepherd will cap what is presently stunning easy walks around the lakeside with views of snow capped mountains. This has to be one of the most beautiful churches in the world – Perched alone on a knoll, perfectly formed with a window looking out at the lake. Hundreds, possibly thousands of visitors each day, with buses, campervans and rental cars rolling in and out regularly. These days no photos inside, which seemed a bit of a disappointment – particularly to the Japanese couple who came in their bridal gear ready for photos. But perhaps it is enough just to sit and look. Beside it a memorial to the working dog – every good shepherd’s best friend. Both church and dog pointing to the more recent story of this land as sheep country. 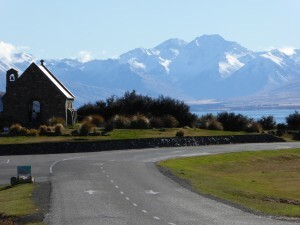 The drive to Mt John Observatory takes you past a gate and sign on the left pointing to Lake Alexandrina. Turn in – this is worth the drive. Another beautifully formed high country lake, with dozens of small fishing cabins (not sure how you book them!) and you can park your campervan for $20 a night.